Do you have days when it’s safer for everyone if you’re left alone? Send a clear message by offering anyone crazy enough to approach you a delicious mint to get rid of the bad taste your mood may leave in their mouth. I Don’t Care Mints are the hysterical way to get your feelings across in an oddly sweet way. I Don’t Care Mints are the perfect mix of sweet and sassy. These tasty wintergreen mints are both a funny gag gift and flavorful breath freshener, making them a hysterical surprise for anyone on your shopping list. - Collectible mint tin reads: Hello! I don’t care. Thanks. 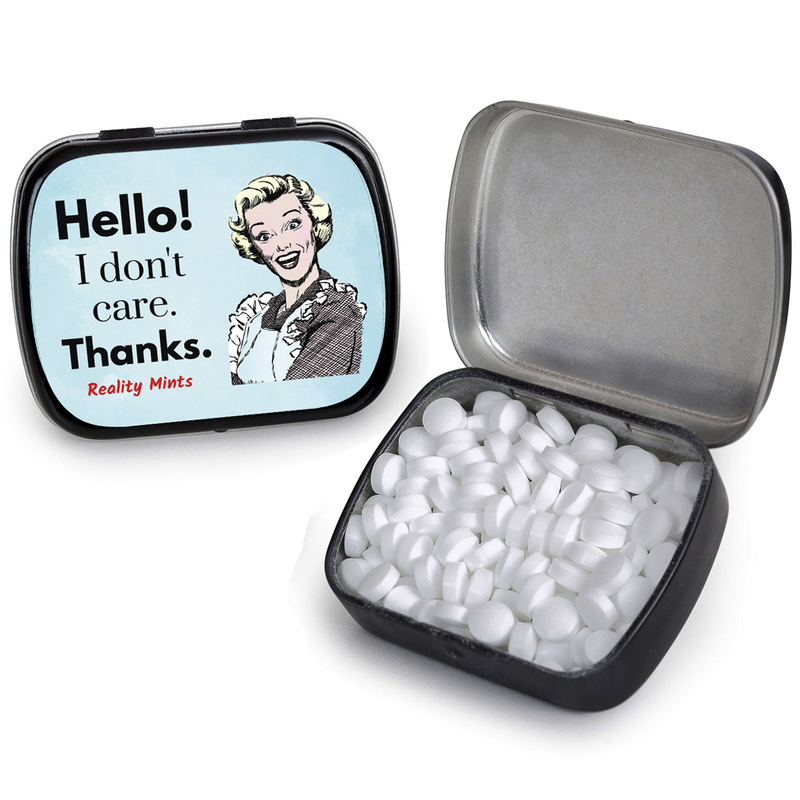 I Don’t Care Mints are a hilarious gift that will catch friends and family off guard. Filled with wintergreen breath mints, this cute, vintage-inspired gag gift for men and women is a silly stocking stuffer or addition to Easter baskets, birthday gift bags, care packages, or Valentine’s Gifts for anyone on your gift list. They’re also a weirdly fantastic choice for White Elephant parties or Secret Santa gift exchanges.